Screen shot of possible desgn. Krazy Kaos Wallpaper lets you design, create, and save your own wallpaper for your iPhone. 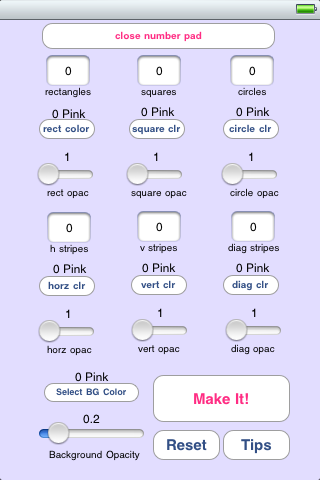 Type in a number for the provided shapes, select a color for each, and the opacity. You can change the background color and opacity too. Press the "Make It" button to create zillions of versions of unique designs! Pressing "Reload" gives you a slightly different version of your previous settings. See dozens, hundreds, or even thousands of versions of each design! The designs you like are saved to your Camera Roll. Use iPhone > Settings to make them your wallpaper. Your imagination is the limit! (Buttons do not appear on saved image). If you are experiencing problems with Krazy Kaos Wallpaper, try deleting it from your phone and re-installing. You can either sync your iPhone with your computer to reinstall Krazy Kaos, (if you have run a sync with your phone with your computer AFTER installing Krazy Kaos the first time), or download it again from iTunes. You won't need to pay again, as iTunes will remember you have previously installed it. The Krazy Kaos user interface. More screen shots of wallpaper designs. (Buttons do not appear on saved image).